This is the culmination of all the holes these girls have been cutting into previous outfits. Paine’s crotch curtain is too much and again, pretty sure she cannot take a single step in that. Yuna looks like an amateur genie and I hate her shoulder capes. Rikku has the best gloves and shoes, although the fishnet stockings seem like overkill on the skimpiness. Her armpit ponytail has got to be tickling her like crazy. Paine looks totally uncomfortable in that outfit and in that pose. That is a LOT of skin. Rikku doesn’t really care, this is probably her casual wear. Yuna…this is the first time I noticed her long rattail. My mind totally blocked it out until I saw the wisp of hair near her leg. Anyway, I love the pink and purple with the gold necklace and belt. I hate cutouts, but everyone has them so I can’t really take points away for that. If there was some sort of cloth shortage and they had to cut holes in everything, sure, these outfits might be explainable. 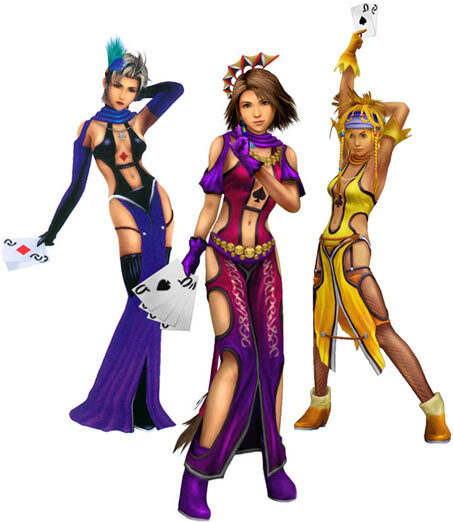 But then Paine’s long gloves and middle third of a dress makes negative sense. Yuna’s head fan looks so out of place that it distracts the eye. Although that might not be a bad thing. Rikku wins by default, but she should take no pride in that.